Inclusive Job Design is a comprehensive term for an employer-oriented method to create permanent jobs for people with disabilities whose chances of competitive employment are limited, especially those that have a low level of education. 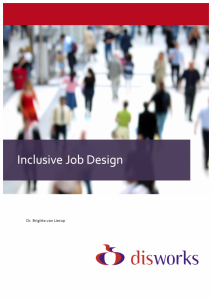 Inclusive Job Design is based on the needs and demands of an employer, the method implies the re-designing of work processes and the splitting of tasks, allowing highly qualified staff to be more available for the work for which they are trained. For many service providers they work in a ‘demand driven approach’, the reality is that ‘placing the person in to work’ has a higher priority, compared to the needs and demands of the employer. In the methodology of Inclusive Job Design, there is attention to the person and to the employer. Inclusive Job Design has been successfully applied in many different work settings, in industry, retail, hospitals and nursing homes as well as white-collar environments. Employers realised an economic benefit when re-arranging the work and many persons with disabilities having low chances to find a job on the competitive labour market, were happy to join the workforce in a job that fits their competences: a win – win situation!